Last week I started and did not finish a piece about the eruption of insanity that accompanied the Miley Cyrus whatever-that-was at the MTV Video Music Awards. I admit I spent part of the week not really knowing what happened because, well, I haven’t watched MTV since they kicked Puck off The Real World or they quit playing music videos, whichever one of those was more recent. By the time I passively absorbed the many layers of ridicule, indignation, and mass hysteria triggered by her performance, I had a jumbled mess of thoughts in my head about our twisted relationship with famous people and what that reveals about our twisted relationships with ourselves. But honestly, my thoughts were too twisted to ask anyone to try to sift through them. And then Johnny Football made everyone crazy. Again. And I found myself having many of the same thoughts. And while I couldn’t name more than one song from Miley’s catalog of work (heyyyy-ey-ey-ey-ey-ey-ey…), I’ve witnessed every jaw-dropping second of Johnny’s, almost half of them in person. Let there be no confusion about my opinion that neither pop music nor football score very high on the scale of matters of eternal consequence. But people fall somewhere on the northern end of that scale, and lots and lots of people are obsessed with these two particular 20-year old people. And lots and lots of people have decided that I am supposed to be shocked and flabbergasted and offended and indignant and angry at these two people as I scuttle my kids to the bomb shelter to shield them from the fallout of Miley and Johnny going nuclear. Particularly when it comes to Johnny, those telling me I should be shocked and flabbergasted and offended and indignant and angry like to appeal to two of my (suddenly) more virtuous qualities: I am a Christian, and I am an Aggie with an honor code, for pete’s sake. Never mind that prior to now, many of these same people telling me I should be shocked and flabbergasted and offended and indignant and angry because I’m a Christian and an Aggie with an honor code (for pete’s sake) have scorned and scoffed at me and my fellow Christians for our Christiany views on things and/or at me and my fellow Aggies (with an honor code for pete’s sake) for our peculiar Aggie ways. Suddenly these same pieces of my identity are why I should join the choir singing Johnny’s shame in unison. Only I love Johnny Manziel. (I like to call him by his actual name rather than “Johnny Football” because – and this is the kind of offensive, perplexing drivel you’re about to encounter here – he’s a real person, not a cartoon character.) He’s not my hero, and he shouldn’t be your hero either. But it’s true. I love him. That confession is immediately met by many with the assumption that I have sold my (suddenly) virtuous Christian and Aggie values to bow at the feet of a celebrity quarterback and the wins that come along with him. But that’s not true. I was at the game Saturday. We won, but I didn’t love everything that happened. I don’t love everything Johnny has done, on the field or elsewhere. But I love Johnny, and that’s the result of a lot more than his play on the field, the color of my t-shirt, and the ring on my finger. My unwillingness to make Johnny the symbol of all that is wrong with ______ (sport, kids these days, twitter, culture, etc.) is actually rooted in my faith and the values I’ve learned in my years as an Aggie. I certainly understand why some will feel differently, and I don’t by default consider those who feel differently to be fools. I’d just appreciate it if those who disagree would think a little better of me and my people, and so I’m writing this little primer to explain why I think I can love Johnny and still go to heaven when I die. And, if I wander into a sidebar about the absurdity of the collective manic episode sponsored by ESPN and a few others in response to various things Johnny has done (or is assumed to have done), it’s only because I think that our frenzied response says as much about us as it does about Johnny. Johnny Manziel poisoning my son by being personable and friendly as he signs roughly his 490th autograph in 90 minutes. I feel no need to duck or minimize this: I love to watch Johnny Manziel play football. Despite being an absolutely useless football player myself in middle school and high school, I love the game. I don’t know why, but I do. And in my many years of loving the game, I’ve never seen a player like Johnny. I have watched hundreds of college football games, many of them in person at Kyle Field, and no one has ever generated the kind of palpable energy Johnny does when he’s on the field. 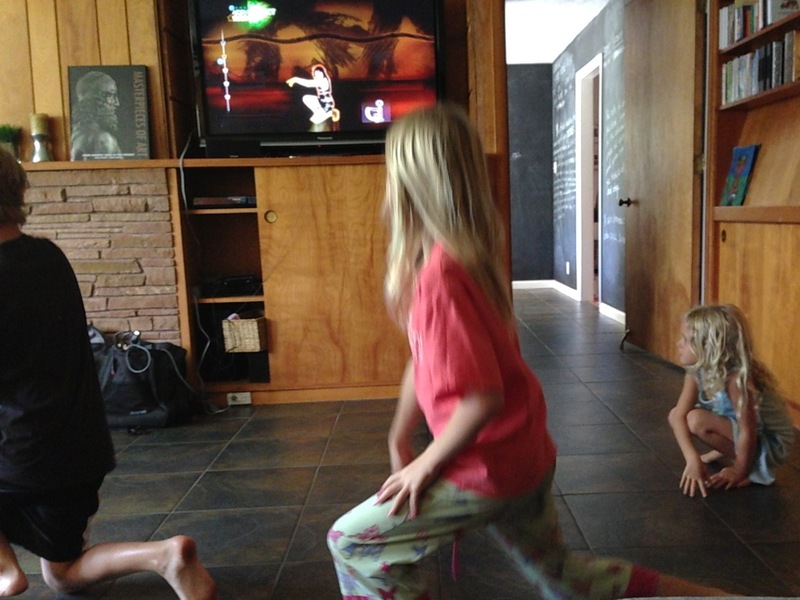 My 8- and 5-year old daughters, who don’t know a first down from a hoedown, feel that energy and respond to it. It’s one of the most bizarre things I’ve ever witnessed. I was about fifty yards from Johnny both when he took his first college snap last year and again Saturday when he marched onto the field early in the second half to the Aggie Band blaring, “When Johnny Comes Marching Home” (which, I don’t care who you are or how much you hate him, was an undeniably epic sports moment) and answered with a salute to the 30,000 or so A&M students roaring for his return from suspension. And I loved it. I’m sorry. I did. Did I also have that weird feeling down in the pit of my stomach that told me what was happening was a bizarre mix of the best and worst of who we are as people? Well, yes. But the longer I follow Jesus in this world and try to walk alongside others doing the same, the more thrilled I am when I come across these intersections of good and bad and sin and grace. Our goal isn’t to avoid those moments; it is to see in them the now and coming victory of the good over the bad. Maybe someday I’ll decide that this is foolishness, but in that moment of Johnny’s return, I saw both people teetering on the edge of idolatry and also spilling out Imago Dei – the image of God inextricably embedded in them. How so? We were made for life and joy and the vibrancy, and those moments were overflowing with all three. But more specifically, we were created to love broken, reckless people the way we love ourselves and to rejoice with them when they have something to rejoice about even if they’re still a mess. And we were created to be loved in our brokenness and recklessness and to have people around us rejoicing with us when we have something to rejoice about. I expect almost no one to see Johnny Manziel as a victim at this point, but everyone should have a people – a tribe who is with them come hell or high water (as one of my tribes likes to say). On Saturday, there was no doubt who Johnny’s people were, and we were with him. Now this is the point at which people around us start to get twitchy. The reaction runs the spectrum from being incredulous that otherwise moral people would stand with this guy to total cynicism that we are anything but blinded by our delight in Johnny winning games. And I get that. I have felt the same way about other crowds supporting their guys when I thought their guys were bums. But I was wrong. Even if I sometimes was right, I was wrong. What I mean is, even if sometimes it was true that people were supporting their guy because they just liked that he brought them success, I was wrong to assume that was true of everyone. And I was wrong to believe or suggest that guys I didn’t know didn’t deserve a people to call their own who were fully in their corner. When Johnny took the field Saturday, I wasn’t smiling ear-to-ear and cheering for him because I think he is an angel, and neither was anyone else. We know he’s a hot mess in many ways (and I don’t even know what “hot mess” means; I just know it fits). In fact, many of us were more amped up because we relate better to the return of the guy who hasn’t been able to keep it all together than to the guy who seems almost flawless. When someone around me gets beaten and battered – even if they were absolutely begging for a beating – I am compelled to come closer, not head to the other side of the road. And when they stand up and make another run at their life, whether that’s trying to get through the day without a drink or returning to the spouse they deserted or walking back onto a football field, I want to be right there saying, “Yes!” And when they blow it and embarrass themselves and those around them while trying to climb back into life, I want to be the guy who is ready to say “Yes!” again the next time. And the next time. And the next time. If I’m honest, I’m not always very good at that, either with people actually in my life or with famous folks who behave badly. Cynicism comes naturally to me, and believing the best or hoping for much from athletes and other celebrities does not. At all. So as much as I love Aggie football, it’s actually a little nuts that I’m writing this – that I’m defending a hot shot quarterback. Aggie or not, I wouldn’t have felt this way in the past. But here is one of the secrets of my weakness: my kids have wrecked my cynicism with their innocent hope. I have done very little to inspire in them any particular affection for Johnny, but they absolutely love him – not just the 11-year old boy, but the girls as well. They know he’s gotten into some trouble (we’ve had great conversations about it), but they just perpetually believe his next move, on and off the field, will be the right one. They may be wrong, and they may have their little hearts broken, but here’s the thing: In some small way, this means the way we are raising them works. We are telling them redemption stories over and over, emphasizing that no one is ever too far gone for redemption to come for them, and they believe. They are, so far, uncorrupted by the dark, ugly “realism” most of us have accepted. They don’t believe Johnny is perfect (well, the 5-year old might). They just believe God made that guy too, so they naturally extend to him the same grace they want me to extend to them when they goof up for the 33rd time. They see in him not only what he is, but what they believe he will be because of God’s love for him. And so they don’t pause to analyze whether God’s love for him might be poured out some way other than (perhaps even opposite to) him being great on the football field. They leave that to God and just scream, “Johnny! Johnny!” every time he touches the ball. I can either dissect the moral or theological precision of their outlook on this or I can sit and learn from them that God can handle that dissection. I should just yell. So as silly as it may sound to some, that potentially idolatrous moment of Johnny’s return was an exaggerated reminder to me of the way I’m supposed to see every such moment in the lives of broken people battling back from their mistakes. In that moment, we all saw hope for redemption. Whether or not it ultimately came or came in the way we all we would’ve liked, we were free to imagine and believe. It was terribly imperfect and laced with all sorts of other misplaced priorities, but it was one of many incomplete tastes of bigger, more abiding realities. The imperfection of it all doesn’t cause me to push this into some category of life that is either irrelevant to or unaffected by the bigger, more important parts of who I am and what I believe. See, I also love Johnny because he is terrible at hiding what is broken in him. If they gave a Heisman Trophy for keeping it together and convincing people you’re doing just fine, I would own Johnny Manziel in that vote. I’m a level-headed, measured, middle-brained introvert who knows how to fly under the radar. The 20-year old version of me was more or less that way too. But let me be clear about this: if I had Johnny’s life at 20, I would have been racked with pride and fear and paranoia and insecurity. I might have never let you see it. I might have kept it together publicly, acted like the smart, stable, humble kid from a small West Texas town, and talked about Jesus as often as I could. But inside I would have been fighting all the same battles Johnny is fighting. And that’s where I differ with so many who are openly expressing offense at and disappointment in who Johnny is. If he just kept all his mess inside and didn’t let it show, what would we think and say about him? If he were impatient, selfish, and self-destructive, but he was good at keeping it off social media and ESPN and knew how to put on his best face for the public, would we be applauding him or deriding him? I’m not sure the answer to those questions reveals something particularly virtuous about us. What I mean to say is this — the 20-year old version of me that I described is not a better guy than the 20-year old version of Johnny that we see. He’s just better at appearances. Despite all of the moralizing and spiritualizing of Johnny’s bad behavior, there simply is no way around this: no one who has decided to run Johnny down by contrasting him with Tim Tebow or Robert Griffin III (two other recent Heisman winners who talked about God a lot and seemed to stay out of trouble) can do so with sound logic or Christian theology in their corner unless you know those guys intimately. Why? Because in every case you are judging the character of men you don’t know based on what you have perceived through the media. Do I need to make a list of famous folks we once thought were boy scouts who turned out to be anything but? Or a list of people we were told to hate who we later found out were quietly doing all kinds of benevolent things that upended our People-Magazine-cover-shaped judgements of them? As often as not, we are lionizing or demonizing people based less on character than on polish. What I mean is we simply do not know whether people we’ll never have a real conversation with are as dreamy as they seem, and we’ll never know whether guys like Johnny are as petulant and selfish as we’ve concluded based on the 0.00004 percent of their lives that we witness through the lenses of social media, teevee cameras, and the media narrative crafted to turn our eyeballs and ears into ad revenue. We only know what we see, and what we see is often very carefully put together for very particular purposes. And frankly, I can’t think of much that we do that is less like Jesus than judging people based on how well they have or have not polished over their flaws. I’m not trying to make everything gray or say there is no right or wrong. I’m not trying to appeal to your inner cynic and cause you to doubt that Tebow or RG3 are actually good guys. I’m trying to say that they probably are good guys with flaws and sins that would disappoint you if you knew about them. I’m trying to say that everyone I know personally who has spent time with Johnny and every member of the media who isn’t just firing from a distance but has actually been with him, says this: He’s a really good guy. (Wright Thompson, who wrote the complex piece for ESPN about a month ago actually said “really good dude.” He also felt enough affection for Johnny to publicly apologize to him and his family for the way quotes from the story were being pulled out of context and sensationalized.) So I’m asking: why do we consider our distant perceptions of other athletes we call role models to be valid while discounting the opinions of the folks who actually know Johnny Manziel? Ultimately I am making what should be the very obvious point that our perceptions of famous people are almost always wildly incomplete, so we ought to be more measured in how we speak and write about folks we don’t know. We ought to be slower both to make people heroes and to make them villains. We ought to ride the brakes on our self-righteous evaluations of how people we don’t know are handling life circumstances we’ve never experienced. I understand the objection here: My opinion of Johnny is based solely on what I’ve seen from him directly. I’ve seen him be an idiot on social media and a selfish punk on the field. That’s all I need to know. And listen, self-control is not a bad thing, so if your beef is that Johnny needs more of it, that’s fine. I don’t disagree. The 20-year old version of me living Johnny’s life probably would have exhibited more self control, at least publicly. The 20-year old version of me who did live also never spent a day with sick kids. Johnny does it regularly. Again, fair is fair. You can’t pick the parts of people you do or don’t like and define them to suit your angle. We’re just not hard-wired to look for nuance or balance, so we focus on the most outrageous thing we see. With Johnny, it’s not hard to find because he doesn’t try to hide his stuff. It’s out there for all of us to see. So throw in a story that he spent the offseason filling his Mercedes with bags of money for signing his name — a story that didn’t have a single named source and that now is being rehashed in the media as though it as fact and with all kinds of stuff thrown in that wasn’t even in the original stories (stuff that many detractors are now repeating as fact) — and suddenly we have the TMZ-styled hysteria that we crave. He’s out of control and disrespecting his coach and alienating his teammates. Only his coach has made it clear that what the media spun as disrespect was Johnny doing exactly what he should have done — hearing that he’d done something stupid, not saying a word in reply, and moving his backside to the bench. His teammates vouch for him repeatedly, even laughing at the silliness of everyone’s obsession with hand gestures and fiery play. The opponent he made the “autograph” motion to is a guy he’s known for years – a guy who made the gesture to him first, and who says Johnny said to him, “What’s up Nick? Nice hit.” The humanity! (Yes, the gesture was dumb from a PR standpoint, but it wasn’t some sort of national statement – it was two guys who have been on a first name basis since they were truly kids having fun with each other on a football field. This is not international diplomacy, folks). When the steam runs out on those charges, the real kicker the last few days has been the 15-yard unsportsmanlike penalty he got for jawing with Rice defenders and pointing at the scoreboard. Sumlin was obviously furious, so we have the magic bullet — a crime no one can use the word “alleged” to describe or suggest didn’t hurt anyone else. It cost his team 15 yards and the pleasure of having Johnny take the field for another series to hang another six points on the board. 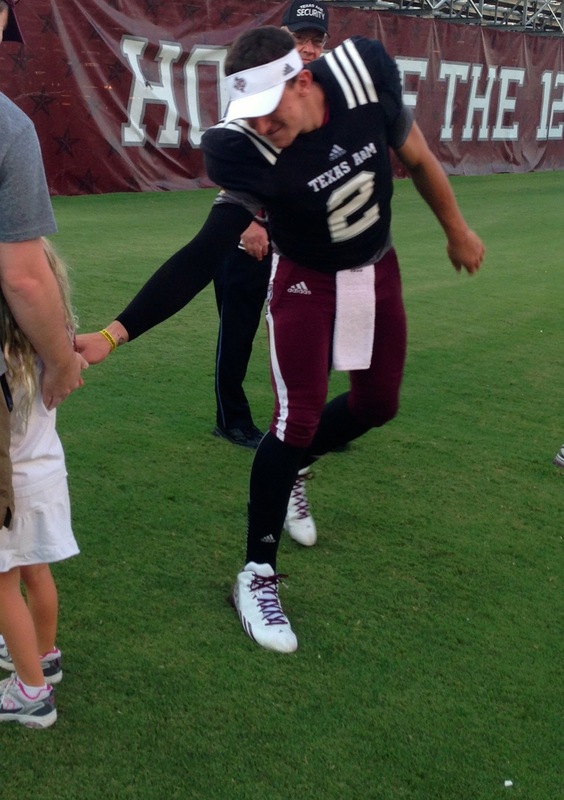 This, no doubt, is proof that Johnny Football is an unstable self-centered jerk making a mockery of the game. Did you see what I just saw? That was Tim Tebow ACTING LIKE AN ALLIGATOR and pretending he was going to EAT that poor kid from Oklahoma with his pretend alligator jaws. But at least it didn’t cost his team, right? Oh, 15 yards, same as Johnny? Hm. Well, at least it wasn’t an important game, right? Oh, it was the National Championship game in which he pinned a 15-yard unsportsmanlike conduct penalty on his team. Wow. Well, but it wasn’t like he was the reigning Heisman Trophy win–. Oh, right. Kids, our sports halls of fame are filled with guys whose athletic ability was exceeded only by their capacity for trash talk, and we consider many of them American heroes. Michael Jordan may have been the best (and worst) talker ever. Larry Bird once approached an opponent before a Christmas Day game, told him he had a present for him, then later canned a three pointer in front of him and said, “Merry Effing Christmas.” Peyton Manning has never backed down from a conversation on the field. Satchel Paige used to not only tell opponents about his dominating stuff, he was known to make his defense go to the bench at times while he pitched to make the point that the hitter couldn’t hit him. Muhammad Ali…I don’t even have to go there. I’m just wondering if anyone can contact Mark May, the clear point man of this broad campaign to convince us that Johnny really is that bad, so he can rebuke these folks, some of whom are pioneers of their sports and of culture, for shaming their respective games. Fair warning: he may be hard to reach on his elevated perch in Connecticut from which he is pouring onto Johnny Manziel gallons of the kind of sanctimony that only can come from a guy who, as a collegian, was arrested for disorderly conduct, resisting arrest, criminal mischief, terroristic threats, and inciting to riot (Inciting a riot! Come on, that is legendary stuff!) and then twice in the NFL for driving his vehicle while in a drunken state of drunken drunkenness. And Mark May is probably a good guy too, to be fair. But the 0.00004 percent of his life we know sure makes it seem like he might not be the right middle-aged cat who has never met Johnny (among all of the other possible middle-aged to elderly cats available at ESPN who have never met Johnny) to be leading the charge to cast 20-year old Johnny Manziel as a soulless beast sent to earth to devour personal character, sportsmanship, and world peace. Truly, my point isn’t to disparage May (all of this information about him is quite public), but this is a brazen illustration of the backwardness of a culture which enables the media to feed on young people for profit with no regard to this kind of obvious and absurd hypocrisy. I know that to those who couldn’t care less about football or to whom Johnny Manziel is just a distant character, this may all seem silly. Sure, some of this is insignificant back-and-forth that matters only to those of us to whom college football matters a little too much. I’ll own that charge. And believe me, I know Johnny didn’t need me in row 13 of section 125 on Saturday, yelling my approval for his return. And no, not all of my jubilation in that moment was the result of some deep spiritual principle. But I believe our completely dysfunctional relationship with celebrity in our culture has so distorted our sense of personhood that we not only see people like Johnny Manziel and Miley Cyrus more as symbols of something we hate rather than as people, but we also scoff at the suggestion that intelligent, honest people could stand by them when they act the fool for any legitimate reasons. And at the end of the day, if you think I’m silly for loving Johnny Manziel and even sillier for writing about it, I can live with that. But here’s the thing, and I just can’t shake it. I’m not writing this because Johnny Manziel needs my approval. I’m not writing because I need some sort of personal vindication as an Aggie. I’m writing because I’ve been implicitly and explicitly asked by bewildered and disappointed people to just admit that Johnny is an embarrassment and call him what he is — a spoiled brat who reflects poorly on A&M, his family, and any other group with whom he claims association. Sorry. No thanks. And I won’t do it to your guys either. I’ve been the fool too many times, and I am surrounded by people who, when I act stupidly, just love me instead of taking to the internet to vent their disapproval of my behavior. Why do they treat me that way? Because the people around me know that I am a real person, just like them. And when we see people as people just like us, we don’t have the luxury of making them into cartoonish heroes or villains who will handily prop up our bogus notions of who the good guys and bad guys are. We remember that people are complex, seldom as one-dimensional as they might seem, and that we’re supposed to treat them as we want to be treated. It’s easy to say, “Bring on the golden rule. If I were in Johnny’s shoes, I would want someone to tell me I was being a selfish idiot.” Sure you would, but let’s just remove the hypothetical. You’re going to be an idiot again sometime soon, probably by next week. So when you’re an idiot next week, would you like for me and thousands of other people who have never met you, some of whom have the freedom to do so for an audience of millions, to publicly call you out for your obvious idiocy and draw conclusions about the whole of who you are based on select moments of your idiocy, or would you like all of those people to not manifest their own ignorance about who you are, insult your character from a distance, and instead let those around you deal with your stupidity? I fear we’ve been suckered into the media’s version of handling sin. When a real person behaves badly, I believe in confrontation and correction. As a Christian and as an Aggie, I believe that confrontation and correction is meant to help the person you’re confronting and correcting. Here is a saying that is trustworthy and true: When the national media engages in its version of pixelated, long-distance confrontation and correction, it has nothing to do with helping anyone except the person who is running his mouth and the shareholders who employ him. To those challenging Aggies and/or Christians for still being in Johnny’s corner, all I can tell you is that I’m not interested in either fueling or imitating that bastardized way of dealing with people’s sin. Do you want me to say Johnny is a sinner? Johnny is a sinner. Do you want me to say Johnny has done some really dumb things? Johnny has done some really dumb things. But if you want me to say that he’s a terrible person or that he’s not an Aggie or that he’s shaming all those who support him, you can flip back to ESPN for that. Look, if we eventually find out that he has those bags of money he got for signing autographs hiding in his closet, that will be disappointing, and I’ll say so. But it won’t change my feeling that the whole pile of Johnny’s personal sins is less of a threat to sports, to culture, and to our kids (including the three in my house) than the reckless, toxic way we speak about real people who stir up our righteous indignation. It won’t lessen my conviction that I have spent too much of my life ridiculing and thinking poorly of people and too little of it wanting them to experience the life they were made for in all of its fullness, whether that life happens in the offices of a high rise, the family room of a home, the hard streets of the hood, or on a patch of grass at Kyle Field. I’ve learned that from my people, who walk with me through my cycles of stupidity and always want good for me because, though I’m not Tim Tebow, I am a real person. So is Johnny Manziel.